NORTH BEND, Wash. -- A massive natural gas explosion early Friday morning destroyed three buildings and damaged several others, blowing out windows and doors and leaving a debris field several blocks long. 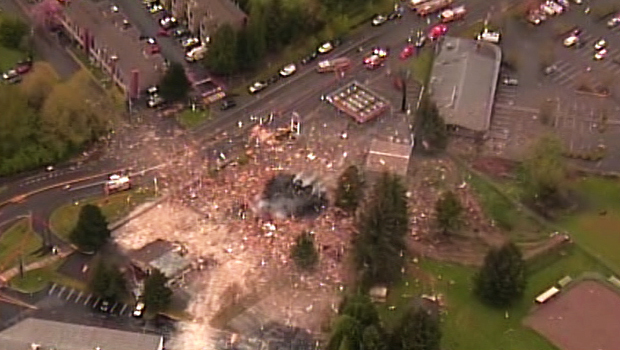 CBS Affiliate KIRO reports that residents heard a large explosion Friday about 3:45 a.m. The blast and resulting fire was at a strip mall which featured a pizza restaurant, barber shop, dance studio and a gas station. Fire crews were quickly at the scene and had the fire under control early Friday, but authorities ordered an evacuation of some nearby apartments over concerns of additional gas explosions. According to authorities, the explosion was believed to be centered in either the Pizza Place (which was closed and undergoing renovations) or the barber shop. Both businesses were destroyed. Fire officials did report some minor injuries in the area, possibly at a nearby nursing home, resulting from cuts from glass. Power has been shut off and Puget Sound Energy crews have contained the natural gas, Eastside fire spokesperson Josie Williams told KIRO. "There was a big boom and I thought it was an earthquake," Linda Crosson, who lives five miles away from the scene of the explosion, told KIRO. The North Bend 76 gas station, located next to the destroyed building, had minor damage, but the station's gasoline tanks did not appear to be affected. North Bend is located about 30 miles east of Seattle.